You might be looking to enter the nonprofit world from one of many different starting points. Maybe you’re fresh out of college and eager to change the world. Maybe you’re mid-career and and hoping for a change. Maybe you’re a parent looking for a workplace that offers a great work/life balance, or a near-retirees hoping to spend your last working years doing something meaningful. Whatever your life path, you might have noticed there’s a lot of conflicting advice out there about working for a nonprofit or charity. That’s what Michelle, a friend of mine from university, originally struggled with when she decided to enter the nonprofit world. Although she had already volunteered at multiple nonprofits, she wasn’t sure which position would best suit her skills — or even whether her Master’s Degree was useful in the nonprofit world. By helping her through her job hunt, and the nonprofit professionals I’ve connected with at through Wild Apricot, I’ve come to see that although working in the nonprofit realm seems simple on the surface, it’s anything but! There are a lot of people out there like Michelle who want a career in nonprofit work — but thankfully, there are just as many nonprofits out there looking for strong candidates. Is nonprofit work right for you? What skills do you need to succeed at a nonprofit? What direction should you take? Do the pros of a nonprofit career path outweigh the cons? Where can you learn more about each type of role? 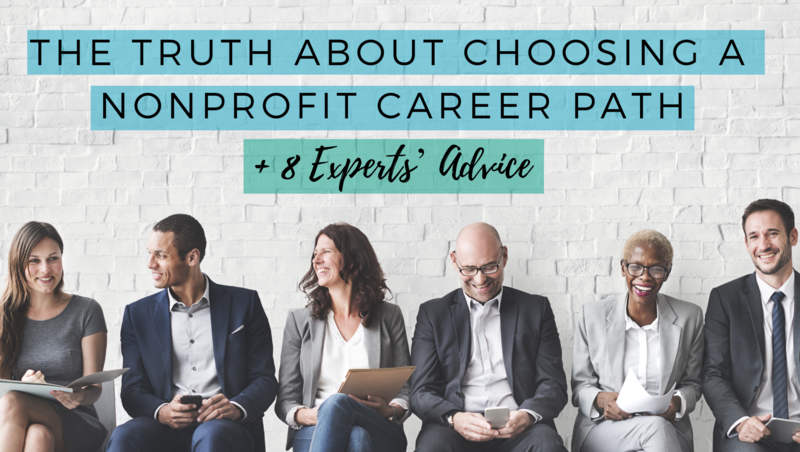 Plus, I’ve asked some nonprofit career experts for advice on the ins and outs of finding the nonprofit career path that’s right for you. First, Answer This Question: Is Nonprofit Work Right for Me? Although you might be coming to the nonprofit world hoping to be a hero, it takes more than goodwill to make a good nonprofit employee. Just like any field, there are pros and cons to consider before you jump in. So, I’ve made this list based on what I’ve heard from colleagues across the industry. Bureaucracy: Nonprofits are notoriously slow to change. This is understandable, considering many have to wait for board approval or nonprofit partner buy-in when making a decision. Lower pay: It’s common for nonprofits to pay less compared to for-profit companies. Limited resources: When every operating dollar comes from fundraising efforts, resources are understandably tight. Working with older computers and limiting copier uses are just some of the ways you may have to watch how you use your resources. Wearing many hats: Nonprofit employees are often responsible for a broader spectrum of tasks than for-profit employees, particularly in small and medium-sized organizations. This can lead to burnout. An overwhelming sense of responsibility: When you’re working for a cause you care about, it’s easy to feel the weight of your role on your shoulders. Intrinsic benefits: It feels good to do good, and working at a nonprofit gives some employees a sense of accomplishment and self-worth. Wearing many hats: Having many roles and responsibilities isn’t necessarily a negative thing. In fact, wearing many hats can help expand an employee’s skill set and improve your chances of moving up the ladder. Non-financial incentives: Since pay is frequently low, nonprofits often offer non-financial incentives to draw in employees, including flexible work schedules and family-friendly practices. You can find a few more advantages and disadvantages to nonprofit work here. And it might not be what you think. Many people think that passion is all you need to work at a nonprofit. Sadly, that isn’t always the case. Instead, the thing I’ve noticed that distinguishes very successful nonprofit professionals is the ability to find balance. But also due to the sense that, if you’re doing a job you’re passionate about, you shouldn’t feel that way — and that you also shouldn’t take too many breaks, in case everything falls apart while you’re gone. That’s why the most-needed skill if you want to work at a nonprofit is the ability to know when you need to step back and take a break. But once you’re confident you can handle it, there are a few other skills you might need. I’ve learned that one of the advantages of nonprofit work is the ability to bring the skills you’ve learnt elsewhere to your current role. For example, if you were a data whiz in your past life, you can translate that skill to cleaning up a donor database. Or if your sorority planned a lot of events, maybe you can become an expert at planning fundraising galas. While the hard skills you’ll need will depend on the role you’re looking for, there are some soft skills that are often common amongst nonprofit professionals. Keep in mind, nonprofits often put greater weight on soft skills with the understanding that employees who meet their soft skill requirements can learn the hard skills over time. Follow Your Heart: What are Your Interests? Charitable work, by definition, centers around helping people and building community. And working at a nonprofit is often seen as a vocation — so it’s important to figure out what you’re willing to devote yourself to regardless of the long hours involved. Choosing your sector might also depend on your previous experience. For example, educators looking for a career change may love to work at an educational foundation, whereas lawyers may decide that a role with legal services is a great way to finish their career. There’s a lot of conflicting information out there about the best educational route for prospective nonprofit employees. Most, but not all, nonprofit positions require a Bachelor's degree at minimum. But just like Michelle, you might be wondering: if you’re looking to make your candidacy stand out, should you aim for a Masters degree? To some, the cost and time commitment to earn a Masters isn’t worth the low pay of a nonprofit position. You can also consider online classes and graduate certificates if a Master's degree isn’t feasible at the time (maybe once you’ve already landed an entry-level nonprofit position). However, there are some major benefits to earning an advanced degree. It shows employers that you’re committed to social good, and you’ll jump into your position with a strong understanding of your field. Next, consider the position you want in your nonprofit career. Just as in the for-profit world, there are hundreds and thousands of different positions depending on the sector you work in — and you might decide to switch between them once you’ve established yourself in your field. These positions generally fall under the following job umbrellas (with sample jobs listed next to each category). Management: Chief Operating Officer, Chief Executive Officer, Chief Financial Officer, Resource Development Manager. It also bears repeating that nonprofit positions often operate differently from those at for-profit companies. Each of these job titles may include multiple roles, and allow you to contribute to a wider variety of organizational tasks than you might see in the for-profit sector. And what’s even better: you might be able to expand your role past its current description if you see an opportunity to improve a process or program. Once you’ve started in one position, you might also decide you want to move laterally into another to advance. You might also decide you want to switch into a different area of the sector to hone your skills and make a greater impact. That’s why, when planning out your nonprofit career path, keeping an open mind is key. Take a Step Back: What Else Do You Need to Know? Whether you’re transitioning into the nonprofit realm from school or another position, there’s a chance that some of the nonprofits you’re interested in working at aren’t a good fit. Only to dig a little deeper and realize that they’d been plagued with allegations of sexual misconduct (yes, it happens in nonprofits too!). So, before you apply anywhere, do your research. Read through their website, search media outlets, and look up employee reviews (if applicable) to get a holistic view of the organization. Where do they get funding? What resources do they provide staff? Do they have strong community support from volunteers, advocates, and board members? What do other employees say about their experience? What does the specific role entail? Armed with this information, you can decide whether applying for the position is the right move. A unique feature of working in the nonprofit sector is the ability to test the waters before working in it. Whether you decide to do direct service or serve as a volunteer board or committee member, nonprofit leadership will learn your name and are sure to acknowledge your efforts over time. And even if you decide you don’t want to work at that particular nonprofit, you’ll have relevant experience to add to your resume for the next one. That’s what Michelle decided to do. She found a nonprofit she was interested in, but at the time they weren’t hiring — so she applied for one of their volunteer positions to learn more about them in the meantime. Another way to stand out is to start at the bottom and work your way up. Although this isn’t an option for everyone, if you’re currently unemployed or are financially able to take a pay cut, it might be a possibility. “Take on a board role and volunteer in the tasks you love most. You'll soon get the experience you need to go to that next stage in your career." Local association chapters: Research relevant professional associations in your preferred job category such as The Association of Fundraising Professionals and the Association for Healthcare Professionals. Local chapters often keep an online job board. Online searches: Use popular job search websites like Indeed, WorkforGood, LinkedIn, and Idealist. Personal connections: Ask friends and family to keep their eyes and ears to the ground about upcoming opportunities. Finding a mentor in the nonprofit sector can also help you figure out the direction you want to go in. Reach out yourself: If you already know a specific nonprofit where you want to work, there’s no harm in reaching out with your resume so that you’re on their radar. Better yet, visit in person to make a stronger impression. Online networks: If you don’t know anyone in your area, there are a lot of nonprofit Facebook groups you can join to get advice and learn a little more about the industry before diving in headfirst. The journey to a nonprofit career is an exciting one. The key is to put effort into finding the right sector and role to fit your skillset, and feel comfortable putting yourself out there to ensure you land your dream job. For Michelle, the story has a happy ending. She found the right for her was at a medium-sized arts nonprofit, where she’s now worked her way up to a director role. She’s seen some staff turnover and strategic shifts since she began in 2016, but she knows she’s where she’s meant to be — and hopefully this post has helped you figure out your career path just like she did! Great insights on building an eyes wide open approach to a nonprofit career. Can also be a useful diagnostic tool for current nonprofit leaders to identify potential staff engagement issues and plan for future leader development. Thanks Michael! Glad you enjoyed. Thanks for advices, I really enjoyed. You are helping slot.